The weather has officially changed and that means it’s coffee shop season again. I guess it’s not really a season, but it sure feels like one when you stop in at some of the most popular spots. 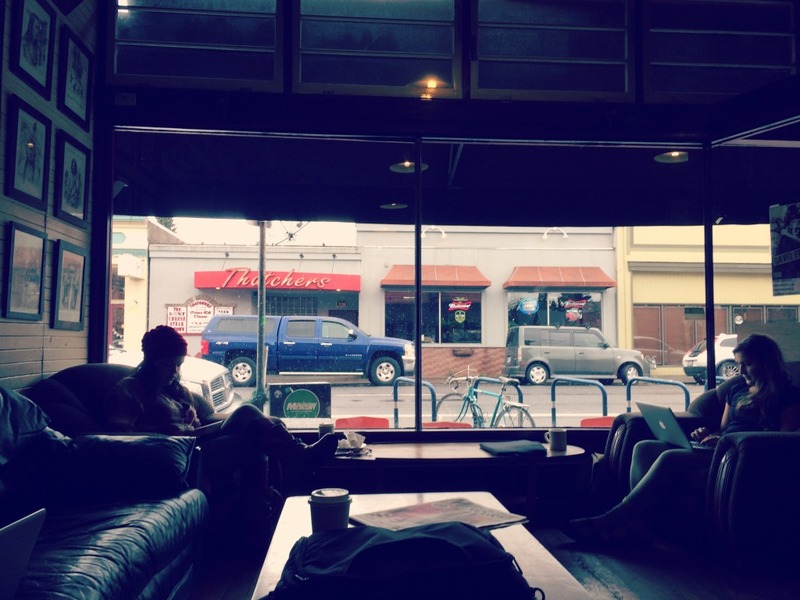 You need to get up pretty early in the morning to find a seat in a coffeeshop on a rainy Portland day. I admit, I am among the throngs Portlanders looking for a spot to enjoy a good cup of coffee and some uninterrupted laptop time. Today I am writing from the Bipartisan Cafe in Montavilla. And it is BUSY. Only room on the couch! But I consider myself lucky to get a spot. And this has me turning to my own website, for ideas on where to go next time I need to get out of the house. I’m trying to enjoy it now, before the baby comes and I’m housebound for at least a few months. Random Order Coffeehouse– Most people consider this spot for pie, but it’s a great coffeeshop too. Not only do they have coffee there’s also a great cocktail menu, plus it’s open until midnight 4 nights a week, so great for night owls. Crema— My hands-down favorite bakery in PDX. But another spot that can be nearly impossible to find a table. Try early morning and afternoons for the best luck. Don’t miss the cheddar corn biscuits. Java Vivace– A beautiful Victorian home on the north end of NW 23rd that serves coffee and crepes. It’s spacious and has a nice vibe. Plus I’ve been going here since I was in high school (!) so I like to keep them in business. Tabor Space– A coffee shop inside a CHURCH! Perhaps a turnoff for some, but if you really need to work, there is no better space. It’s almost like a library inside, plus it’s beautiful. Go somewhere else if you and the ladies want to chat about your lady problem or recent one-night stands, everyone will hear you! 5 Coffee Shops, 5 Days– A little piece I did this time last year, where I spend a whole week trying out a new (to me) coffee shop in each of the five quadrants. It was a lot of fun. I might need to do this again! Happy coffee season everyone. Let me know if there’s someplace I need to check out.